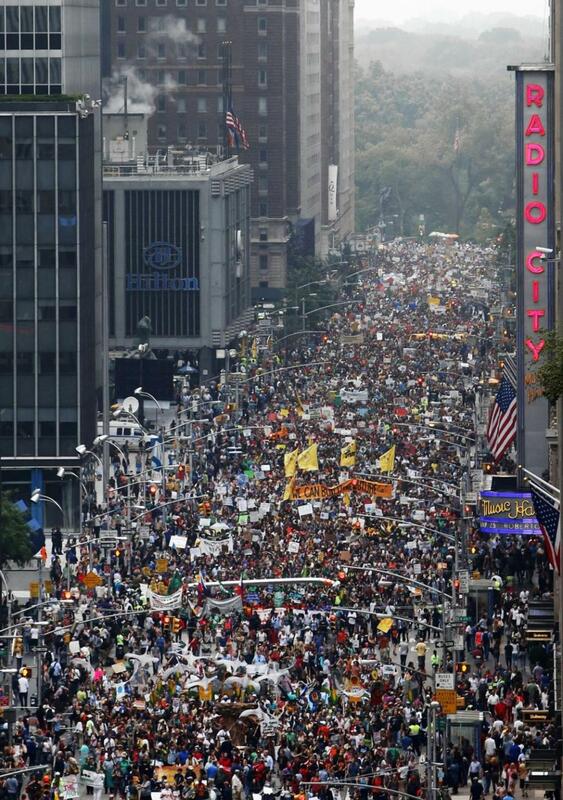 The significant union presence (including the SEIU, CWA, Teamsters, IBEW, AFSCME, UAW, NYSNA and the TWU) on Sunday’s march also shows a growing consciousness in the labor movement about the connection between our current economic system and the devastation of our environment. The march spanned a total of about four miles, from 90th Street all the way down to 34th Street. Organizers established six primary “themes,” fitting each individual contingent into a broader category. Socialist Alternative’s contingent was grouped into the “Anti-Corporate Campaigns, Peace & Justice & More.” Our banner read: “Capitalism failed people and the planet; join the struggle for socialism.” Other nearby contingents were System Change Not Climate Change, as well as the Flood Wall Street contingent, a group that would go on to lead direct actions the next day, shutting down much of lower Manhattan. While the organizers of the march should be credited for setting off a new phase of the environmental movement, there were clear political weaknesses. 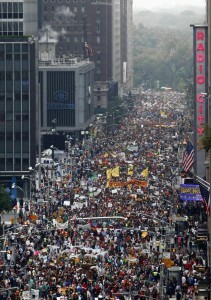 The march received sponsorship from a number of corporations, including Lockheed Martin, BP, and Goldman Sachs. The organizers also failed to put forward any clear demands and did not allow any groups to put forward speakers. Most serious of all, while the organizers openly and correctly stated that one demonstration would not solve the problems facing the environment, they failed to provide any guidance or leadership on what the next steps of the movement would be. If the march had called for taxes on the corporations and super-rich to fund a green jobs program, this could have given direction and impetus to future climate justice actions. From there, campaigns could be organized with mass protests on campuses and in communities to demand a huge expansion of public transportation and a transition to publicly-owned green energy. But although the organizers weren’t clear on these points, the large numbers of the protesters were. 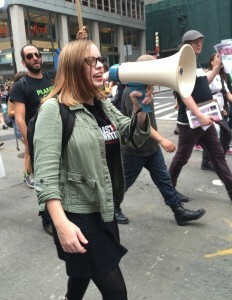 The theme of “system change” appeared throughout the march, from the eco-socialist contingent to explicit calls for the need to overthrow capitalism, many on homemade signs. The calls for systemic change clearly indicate a real understanding among a broad swath of people of the need not just to reform our current capitalist system but to actually break with the system altogether. Of course, there is still a great deal of confusion about how to go about this or the next steps to be taken. The hunger for answers was reflected in the overwhelmingly positive response Socialist Alternative got at the march. People were flocking to our tables looking for more information about our work, many of whom openly identified as socialists. 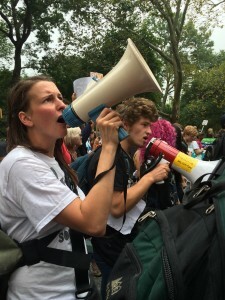 What became clear from these discussions and the signs people were carrying is that an anti-corporate and even anti-capitalist consciousness is rapidly developing, spurred not only by the threat to the environment but also by the other products of capitalism: inequality, racism, sexism and war. Capitalism destroys more than just the environment, and it is our task to connect the struggle against human-caused climate change to the myriad of other injustices and degradations wrought by capitalism. With so many people convinced of the need for system change, it becomes the task of socialists to explain and articulate what kind of system we need to put in capitalism’s place as well as the way forward for the movement. Bold actions and campaigns are required to build on the momentum from September 21st. For example, on the same day, as already reported, the climate change protest in Seattle ended with a successful direct action to block an oil train. 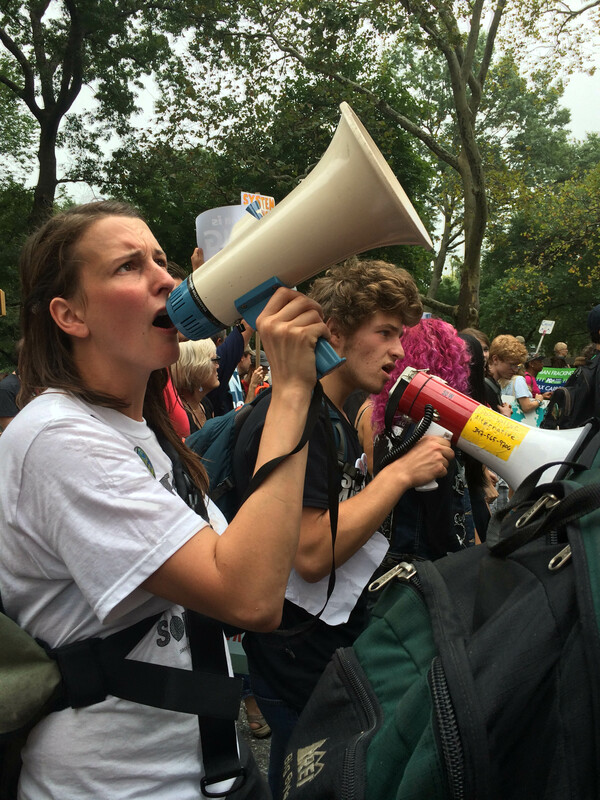 There is a rapidly growing movement on college campuses calling for divestment from fossil fuels. These campaigns and calls to action need to be broadened and lead to further mass mobilizations. The labor movement needs to become more involved and prepared to take solidarity action with the environmental movement. The movement also needs to adopt a clear set of demands that can mobilize the widest possible support from the working class. As stated above, these should include the demand to tax the rich in order to create a massive green jobs program, a massive expansion of mass transit, and public ownership of the energy industry. But the movement also needs to establish independence from both political parties of corporate America. 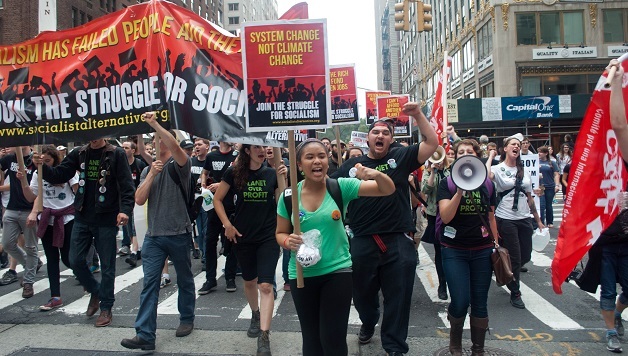 The environmental movement, alongside the movement for a $15 minimum wage and other social struggles, urgently requires expression through a new political force representing the interests of the 99%. As a first step, we need far more genuine left candidates like Socialist Alternative’s Jess Spear, an environmental scientist who is running speaker of the Washington State House. But in order to end climate change, we need to end capitalism. The huge wealth and power held by big polluters has been gained at the expense of humanity and the environment. Rather than further destruction, that wealth should be used to rapidly transition to 100% green energy use and to organize our society’s huge potential to meet the needs of everyone. This is what a socialist society would look like. Join Socialist Alternative in that fight today!